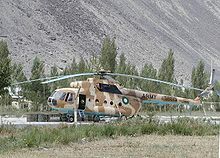 The 2009 Pakistan Army Mil Mi-17 crash occurred on July 3, 2009 in the Federally Administered Tribal Areas of Pakistan. A Russian-manufactured Mil Mi-17 transport helicopter of the Pakistan Army crashed in Orakzai Agency. According to a source within the Army the crash was due to a technical fault. Some sources reported local people attributing the crash to militant activity. The crash site was Chapar Feroze Khel, 20 kilometres (12 mi) from Peshawar, on the border of the semi-autonomous Orakzai and Khyber tribal agencies. The area is remote and also full of militants, which hampered the rescue efforts. Official accounts stated 26 soldiers were killed in the incident, but other sources put the toll at 41 people on board, all of them being killed, including 19 from the paramilitary Frontier Corps, 18 army personnel and 4 crew members. The Mi-17 is normally limited to carrying 32 passengers. Most of the personnel on board were due to go on leave. The helicopter was flying from Parachinar, the headquarters of Kurram Agency, to Peshawar. Previously there were unconfirmed reports that the helicopter might have been hit by ground fire from militants, with four casualties reported, but these were contradicted by a Inter Services Public Relations report. There was an ongoing operation in the area against militants linked to Al-Qaeda at the time of the crash. Militants have claimed they shot down the aircraft and that the Taliban captured the pilot; if true this was the first such incident. Chief of the army General Ashfaq Parvez Kayani ordered an inquiry, but the crash prompted speculation whether the transport helicopter attracted militant gunfire and was shot down. This speculation is based on the fact that the area is a militant stronghold, and the militants had 12.7mm machine-guns capable of hitting a low flying aircraft. Combat and transport helicopters usually fly high to avoid fire from the ground. An official said that it would take some time before the actual cause could be determined. According to sources[who? ], the pilot had requested an emergency landing. They also blamed it on overloading of the aircraft. Witness accounts say that it was flying at low altitude in the mountains. ^ a b c d e f g h "Helicopter crash kills 41 security personnel". Dawn (newspaper). 2009-07-04. Archived from the original on 2009-07-06. Retrieved 2009-07-04. ^ a b "Helicopter crash kills 26 soldiers in Orakzai". The Nation. 2009-07-03. Archived from the original on 2009-07-08. Retrieved 2009-07-03. ^ "26 killed in military copter crash in Pakistan". PressTv.com. 2009-07-03. Retrieved 2009-07-03. ^ "Technical fault caused chopper's crash: ISPR". Geo.tv. 2009-07-03. Archived from the original on 2009-07-06. Retrieved 2009-07-03. ^ "At least 26 soldiers killed in Orakzai helicopter crash: officials". Dawn (newspaper). 2009-07-03. Retrieved 2009-07-03. ^ "Helicopter crashes in Orakzai: military". AAj.tv. 2009-07-03. Archived from the original on 2019-03-30. Retrieved 2009-07-03. ^ "Helicopter crash kills 26 in NW Pakistan". AFP. 2009-07-03. Retrieved 2009-07-03. ^ Mehmood, Hasan (2009-07-04). "26 perish in Army helicopter crash". Nation (newspaper). Archived from the original on 2009-07-08. Retrieved 2009-07-04. ^ "26 dead as Pak Army helicopter crashes in Orakzai". Dawn (newspaper). 2009-07-03. Archived from the original on 2009-07-06. Retrieved 2009-07-03. ^ a b "Taliban claim to down Pakistan military helicopter". AFP. 2009-07-04. Retrieved 2009-07-04. This page was last edited on 10 April 2019, at 10:45 (UTC).